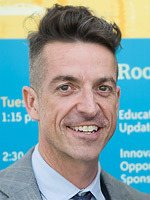 Mark Lenhart is the executive director of CET Academic Programs. In 2014, Mark received the Lily von Klemperer Award at the 66th NAFSA Annual Conference & Expo in San Diego, California. Mark has worked for CET since 1990, when he began as resident director of CET's Harbin Chinese Language Program. After nearly 5 years studying and working in China, he became CET's director in 1995, and he oversaw CET's expansion from a small provider of two Chinese language programs to a much larger organization with programs in eight countries. Mark is a founding board member of the Fund for Education Abroad and a frequent presenter at study abroad conferences. As a student, Mark focused on Asian studies, Chinese language, photography, and cultural anthropology. He has degrees from Bowdoin College, Harvard University, and the University of Maryland. Mandy Reinig: What's on your calendar for today? Mark: Lots of meetings! Today I am having one-on-ones with the executive team at CET. The things we're discussing include how to resolve problems with an overseas partner, a hiring decision, and working on marketing for a new program. My day-to-day includes a lot of checking in with people on various problems and hearing what they recommend. There are always surprises and unexpected challenges! Mandy: Where do you like to travel for fun? Mark: It sounds funny, but the more I travel, the more I appreciate being home. My husband and I have a small condo in Provincetown, Massachusetts, so when we have free time, we like to land there and really unplug. Mandy: How many countries have you been to? Mark: I have only been to 12 countries, but I have probably been to China more than 50 times. It's where I studied abroad myself in the 1980s. Mandy: Describe a “pivotal career moment” when you knew you were ready to move from managing education abroad programs to leading a broader internationalization strategy. Mark: My pivotal moment came when I was considering working with some colleagues to launch the Fund for Education Abroad, which is a non-profit scholarship organization dedicated to increasing access for underrepresented study abroad students. This was perhaps the first time I started thinking seriously about how I can have an impact beyond CET. At the time, we had a lot of uncertainty about how to set it up, how to make sure it was independent and well-governed, and how to make it succeed in its mission. Five years later, it's amazing to see how big an impact it's having. In 2015, FEA will award 40 game-changing scholarships to study abroad students. FEA's Annual Reception will be held November 18, 2014, at the Long View Gallery in Washington, D.C.
Mandy: What are a few skills you find are necessary to your role as an senior international officer (SIO)/senior EA professional? Mark: Leadership and management skills are obviously critical. But I've learned you can't be a great leader or manager without really strong communication skills. You need to invest time to communicate effectively, both in person and in writing, within your organization and beyond. As CET has grown, it's become especially important that I make sure everybody at CET—from our staff in D.C. to our teachers in Osaka—understands our mission and plans. Communicating across cultures is also important; when speaking to representatives of our host universities, I need to be mindful of the cultural differences and expectations at play. Mandy: What do you like most about your role as SIO/senior EA professional? Mark: People are often surprised to hear that I have worked for CET since 1990—that I have never worked anyplace else. But the reason is simple: I love how challenging the work is, and I love that the challenges are different every year. We often say here that there's “never a dull moment” and that's very true. I am always learning, particularly as we grow. Mandy: What do you like least about your role as SIO/senior EA professional? Mark: I think there's a misconception that my job is very exciting because of the international travel, and that I get to travel all the time. In fact, the trips are a lot of hard work. The jet lag, busy schedules, and travel conditions take their toll! Mandy: What are some of the major challenges you face in your role as an SIO/senior EA professional and how do you face them? Mark: We are starting to think critically about how we communicate with our overseas staff. We tend to approach communication like the spokes of a wheel, with our D.C. headquarters in the center. Now we are looking to use technology to increase direct communication between our overseas offices, rather than exclusively through D.C. Also, it has always been a challenge to predict enrollment: will there be decreased interest in countries or languages, or increased safety risks in specific locations? Predicting trends can be really hard to do, but it's important because it affects how we allocate staffing and other resources. Mandy: What are a few pieces of advice you would give new and mid-career EA professionals who are looking to continue on towards eventually becoming a SIO/senior EA professional? Mark: Do what you love! Match your special interests with the needs of the field. Figure out what your strengths are and hone skills in that area. For example, in the future there will probably be more study abroad jobs related to mental health, law, and risk management. My advice would be to pick one of these areas, develop related skills and expertise, and use that knowledge to advance towards a more senior position. Mandy: How has NAFSA assisted you in your role as SIO/senior EA professional (either with resources, events, etc.)? Mark: Annual conferences are great for meeting partners and potential new partners. My volunteer positions have allowed me to build a network and understand the field more broadly and leverage that to my benefit. The first group I got involved with was the Rainbow SIG. I love the SIG because it represents a great cross-section of NAFSA's different stakeholders—not just people working in education abroad. CET has also sent many people through the NAFSA Academy, and this has really benefited us as an organization. The discussion forums are great just for news, updates, and to know other people are dealing with similar challenges. Mandy: Do you feel there is a shift in the SIO/senior EA professional profile, and that the new generation of SIOs/senior EA professionals coming up in the field of international education necessarily needs a PhD to perform well in their position? Mark: I think there is a shift away from faculty appointments to more professional appointments. I don't think that PhDs are a requirement, though I'm excited that there is a new generation of SIOs who have PhDs and who can do important research examining the impact of study abroad. Mandy: Where do you see yourself in 5 or 10 years from now? Mark: Right here! I want to still be with CET and still be in D.C. It is hard for me to imagine working someplace else. Mandy: What do you see as current trends within education abroad? Mark: There has been greater emphasis on increasing access through diversification. Also, there has been new interest in career integration – how study abroad fits into a student's career path. At the heart of both trends is an interest in growth: how do we send a higher percentage of American students abroad? I'm really glad we're focusing on these two areas. Mandy: What is the one thing you don't think the field is giving enough attention to? Mark: I don't think we are placing enough emphasis on foreign language teaching. It is becoming easier to lower our expectations for study abroad students since so many host institutions are beginning to offer coursework in English. But these new offerings do not change the fact that our students need proficiency in the local language. Beyond increasing students' ability to communicate, language instruction also helps in the realm of intercultural skills. I often say that it's impossible to achieve advanced Arabic or Chinese skills without learning intercultural skills. If we teach language, we cannot help but also teach culture. Mandy: What's the one thing you never travel without? Mark: My camera. I was a photography student in college, and when I first studied in China, I was given a small grant to work on a photo project while studying there. The project really shaped my experience. When you carry a camera, you end up looking at and engaging with your surroundings in a more intentional way. You are forced to frame things or see things differently. I often encourage students to use their cameras as a way to engage local people. It's not always easy, but if students ask “may I take your picture?,” it can lead to some very interesting exchanges. Read more interviews from EA leaders. Upcoming events and resources for senior EA professionals. Explore professional learning opportunities related to Education Abroad.